It is the final stretch for horse racing in the Spa City, AND it’s also the final days of voting for “America’s Favorite Farmers’ Market”! This national contest is sponsored by American Farmland Trust (www.farmland.org) and voting ends on Saturday, August 31. Our very own Saratoga Farmers’ Market is in a close three way dual for first in the medium size division of the 4-category contest. It’s NY vs Delaware and Virginia. It’s Spa City vs the beach town of Lewis, DE and suburban Falls Church, VA. 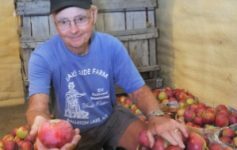 The odds makers might have us losing by a vote or two, but New Yorkers love the underdog, so lets show it and vote for our own Saratoga Farmers’ Market! large), it is offering the winner in each category cash and advertising. deserved award for this community. workers into the local hotels and restaurants. farming. All absolutely true for Saratoga. *Vote and let the world know!